Do you love to be scared? Does the thought of a Cursed Hayride, where the undead can steal your soul, give up chills up your spine? Do you want to be terrified by scary clowns in Bedlam 3D? Do you want to get lost in the Deadwoods, trying to escape from the crazy Tate family? Then get ready for SCREAM-A-GEDDON! Voted Best Newcomer and #5 overall best haunted house in the country by USA’s Best Haunted Houses after just their first year, they’ve lived up to the hype and added even more scary attractions. Forget old school haunted houses where you walk through the dark and people jump out at you. At SCREAM-A-GEDDON, you can choose to be part of the interactive haunted house. In Infected, you can chose whether to accept your infection and go with the other Infected, or be a bystander, watching all the scary action. The level of scary that you experience is decided by you! New this year is yet another interactive haunted house, Blackpool Prison. You decide if you want to go through the prison post riot with the scariest criminals of all time! Don’t like haunted houses but still want to see what SCREAM-A-GEDDON is all about? hang out in the Monster Midway while the rest of your group gets the pants scared off of them! Enjoy traditional carnival food, beer, and wine while sitting around a fire in the safety of the midway. But are you really safe? You never know what monster might find you! Sound like you absolutely have to go? You’re in luck! I have four tickets to give away! To enter, just comment below which attraction sounds the scariest and I’ll pick one winner at random on Wednesday, September 21st. Tickets will be mailed to the winner’s address. 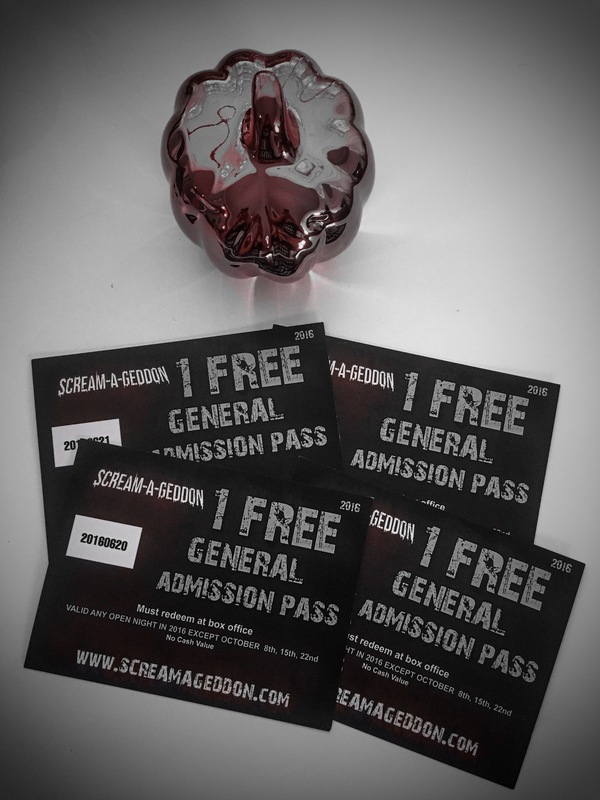 SCREAM-A-GEDDON is open from September 23rd to November 5th, with occasional closed days. You can find the hours here. Tickets range from $9.95 to $29.95 and you can by them here. Blackpool prison for sure!!! Interactive haunted houses are Always the scariest since they can put their hands on you!! Super pumped to go back again this year! Last year was amazing! SO much better than HHN! All the interactive attractions is what takes this experience to a whole new level. I haven’t been there before but heard from friends it is freaky!! Um duh….the prison one where the inmates can touch you. I plan on wearing a depends when I go. Just in case. You already know, I’m INFECTED!! !